Lama Zopa Rinpoche with Ladakhi Lama, the attendant of the previous great Khunu Lama Rinpoche, Root Institute, Bodhgaya, India, March 2014. Photo by Ven. Roger Kunsang. The Buddha’s teaching on the four noble truths are essential to our understanding and practice of Buddhism. 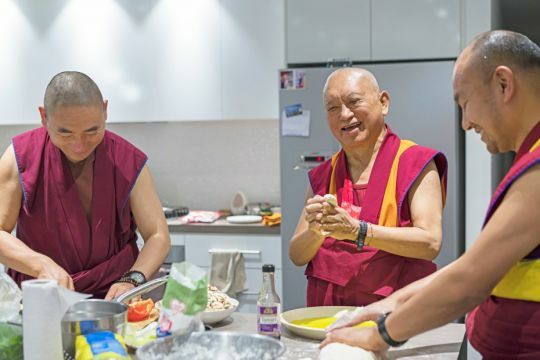 Lama Zopa Rinpoche provides clear instruction on this fundamental teaching in his new book The Four Noble Truths: A Guide to Everyday Life, just published by Wisdom Publications. Here we share a short extract from a longer excerpt published on Wisdom’s blog. In the excerpt, Rinpoche discusses actualizing bodhichitta and offers examples of twentieth century Tibetan masters, including the following. … The late Kyabje Khunu Lama Rinpoche, a learned and pure practitioner of bodhichitta, was tutored by the great Buddhist masters in Tibet on philosophy and other types of knowledge. During the early days of Tibetans arriving in India after the Chinese takeover of their country, Khunu Lama Rinpoche lived like a yogi, dwelling with the Hindu sadhus in Varanasi along the Ganges River. One day, clothed like a sadhu—wrapped up in plain cloth and looking unwashed—Rinpoche went to a local Tibetan monastery to ask for a small room. The monks there did not recognize Rinpoche and said no room was available. Rinpoche slept outside on the bare ground, the way the beggars did. His Holiness the Dalai Lama was visiting that place at the time and knew what was happening, so he went directly to where Khunu Lama Rinpoche was and requested teachings and commentary on the Bodhicaryavatara. Word quickly spread that a great bodhisattva was living there, and soon long lines of people gathered seeking advice from Rinpoche. Kyabje Khunu Lama Rinpoche was able to recite by heart passages from any root text of the Buddha’s teachings and any of the commentaries. His mind was so robust and totally clear it was most amazing. His holy mind was like the entire Buddhist library. I once went alone to Rinpoche to request a commentary on the Bodhicaryavatara. Rinpoche declined on that occasion but gave me the complete oral transmission of that text. Rinpoche then told me to translate the Bodhicaryavatara, even though he knew others had already translated it. “You translate,” Rinpoche said to me, advising me that before translating one must know the language and the subject well. I have not yet done the translation, but hope to do so sometime in the future. I once attended teachings by Rinpoche that went on for a whole day with no break. Rinpoche then approached the wisdom chapter of the Bodhicaryavatara, an unbelievably precious teaching for one who seeks freedom from samsara. However, the minute Rinpoche started teachings on that chapter, I fell asleep. Until that moment I was wide awake. But when Rinpoche began the commentary, sleep overcame me. Some unbelievably bad and heavy negative karma from my past life must have caused that. Imagine—at the wisdom teaching that will bring liberation, I fell asleep! 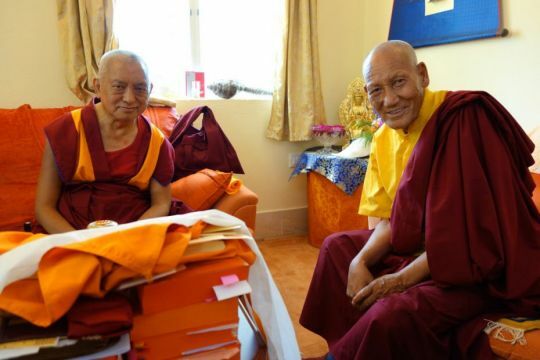 Lama Zopa Rinpoche doing prayers with Geshe Sopa Rinpoche a month before Geshe Sopa passed into clear light meditation, Deer Park Buddhist Center, Wisconsin, US, July 2014. Photo by Ven. Roger Kunsang. A student in severe pain wrote to Lama Zopa Rinpoche seeking advice. 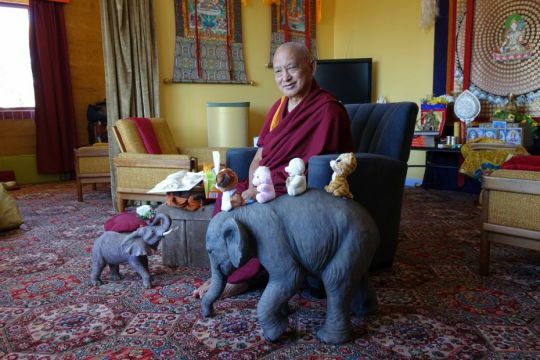 Lama Zopa Rinpoche explained how to experience the pain for all sentient beings. It’s very good to think that you are not the only one in pain. My sister has so much pain in her knee all the time, for many years. Also, generally in the world numberless people have so much pain in the hips or in the knees. 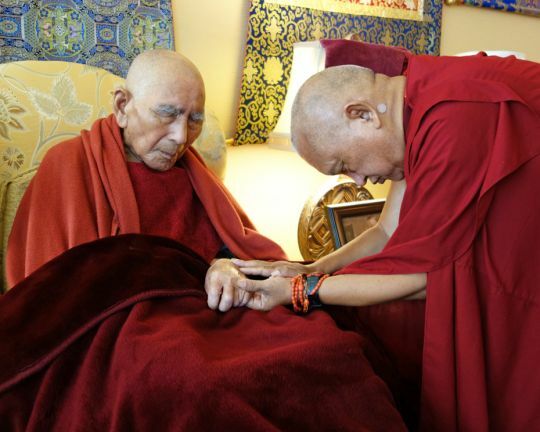 Geshe Sopa Rinpoche took the aspect of having pain in the knee, but he had an operation and one leg got better, but the other leg was still painful. Geshe-la took that aspect. Through my experience of this pain, may all mother sentient beings—the numberless hell beings, hungry ghosts, animals, humans, suras, asuras, and intermediate state beings—be free immediately from all disease and spirit harm, including hip and knee pain. May they be free from the cause of the pain, delusion, and karma, and not only that, may they all achieve buddhahood as quickly as possible. In this way dedicate your pain to all sentient beings. Recite this like a prayer or a mantra, just like reciting OM MANI PADME HUM or any mantra. This is the best practice to purify all your defilements and negative karma collected from beginningless rebirths, and not only that, to also collect the most extensive merits. Dedicate to the numberless hell beings, hungry ghosts, animals, humans, suras, asuras, and intermediate state beings. In this way you collect the most extensive merits and this causes you to achieve enlightenment, so you are very fortunate, unbelievably lucky. This advice is from one great yogi called Choje Götsangpa. This is his practice and advice. Vens. Michael Lobsang Yeshe and Thubten Lhundrup offering tsog to Lama Zopa Rinpoche, Great Stupa of Universal Compassion, Australia, May 2018. Photo by Ven. Lobsang Sherab. Lama Zopa Rinpoche sent these words of encouragement and advice in a handwritten card to the monks at Nalanda Monastery. Like the worldly Olympic champions, you are all like warriors against the enemy: delusion, which has made all sentient beings suffer in the oceans of samsara numberless times in the past, including the sufferings of the hell beings, intermediate state beings, and pretas—all the sufferings. Not only is oneself suffering, also numberless sentient beings are suffering, endlessly. The rest of the world’s champions are not champions, just silly and childish, but you, the Sangha, are the real champions, the best champions, because to defeat and control delusions is the most difficult thing. You’re doing that; you are the best champions. Even though it is the most difficult thing, it is the most important thing in life to defeat delusions, to extinguish them completely, so there is no trace. Therefore, what you are doing is so special, because by ceasing delusions completely, only then are you free from all the sufferings forever. Then, also, you can liberate all the other sentient beings, who are numberless, from the oceans of samsara’s suffering. The most enjoyable, exciting thing is that you can liberate others. Even to liberate one sentient being is the most exciting thing. This experience: liberation, actualizing the path, is the most important thing to dedicate to, to live for. In the West, they do all kinds of research on the slightest thing, on cockroaches and so forth, spend so many years studying dolphins. When you die, what benefit is there from so many years of this study? We have had all the samsaric pleasures numberless times. We have experienced all the pleasures of the devas numberless times. Whatever pleasure there is, it is nothing. There is no better life than your life as a member of the Sangha, living in the pratimoksha vows. This is the most “yum yum,” delicious life. If one doesn’t realize the benefits of living in the pratimoksha vows, if one doesn’t know them, then you might think it is similar to taking medicine. If one doesn’t know that it is medicine and can help you, then it appears as a poison. By knowing the shortcomings of samsara, of worldly life, one can have skies of happiness by living in the pratimoksha vows, renouncing the householder life. You feel free. This way you can have the most precious and most happy life. 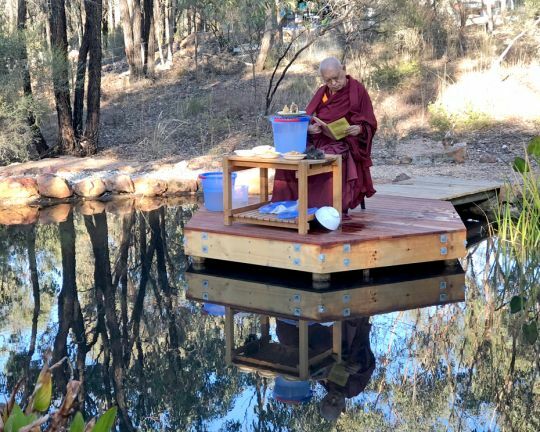 Lama Zopa Rinpoche spent over two months visiting Australia earlier this year. 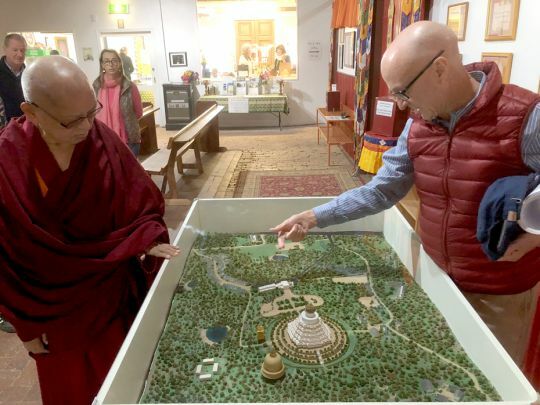 We’ve created a new photo gallery sharing images from the time he spent at the Great Stupa of Universal Compassion, Atisha Centre, and Thubten Shedrup Ling Monastery in Victoria; Buddha House in South Australia; Chag-tong Chen-tong Centre in Tasmania; and Chenrezig Institute in Queensland. 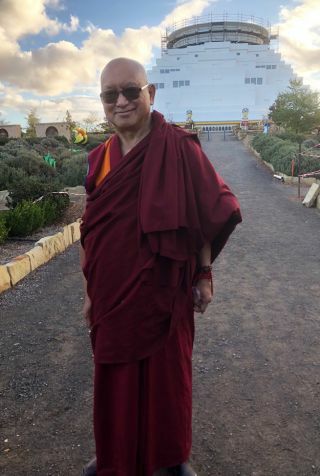 Rinpoche spent six weeks leading the Bodhicaryavatara (A Guide to the Bodhisattva’s Way of Life) and Rinjung Gyatsa Retreat at the Great Stupa, giving more than sixty teachings. Video recordings of these teachings are available, as well as teachings from Chag-tong Chen-Tong Centre and Chenrezig Institute on FPMT.org’s “Rinpoche Available Now” page. In addition to video recordings, unedited transcripts and audio files from the teachings are also made available on this page. The essence of the Mahayana teaching is to let go of the I and to cherish others who are numberless. Even by cherishing one sentient being, that brings enlightenment to you. That means you are able to free all sentient beings from the oceans of suffering and bring them to the peerless happiness, buddhahood—the total cessation of obscurations and completion of realizations. That is why even if one insect falls in the water, to arise compassion and help that insect is so important. Or if an animal, such as an ant, is attacked by another animal, to help rescue it with compassion. Also to help even one person with problems, with suffering, for example, to help rescue someone or to help someone who is suicidal, to help them not to be suicidal. It is said in the Chenrezig sutra Well-Condensed Dharma, that you don’t need to follow many Dharmas, only one, which is compassion. If you have compassion then the whole Buddhadharma comes, which means in your heart, all the understanding of the words and all the realizations. The conclusion is that if there is compassion you can achieve enlightenment. Without compassion, no enlightenment. Ven. Sangpo making the chili for the potato pancakes, Vienna, Austria, September 2017. Photo by Markus Igel. Relating to cooking, it is very important. As you know, cooking gives so much happiness to sentient beings. What I have heard from Kopan is that the food is very good and even if people don’t like the meditation course, they stay. So that helps them and even if they do not understand the teachings or the meditations, they stay, and it leaves a positive imprint in their mind. Besides that, they achieve everlasting happiness, nirvana. This is one example related to the Kopan courses in Nepal or the Tushita courses in Dharamsala. I like to make food for people because it pleases their mind very much. When you know how to make different food delicious, one of the greatest benefits is that you can invite your gurus and make food for them. They enjoy it and you collect the greatest merit and this becomes the greatest purification. That means especially by pleasing the guru it becomes a quick way to achieve enlightenment. So many negative karmas get purified on the way. By making delicious food, you make the guru happy. Ven. 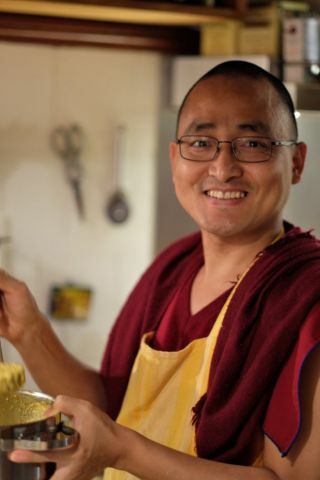 Lobsang Sherab making potato pancakes, Vienna, Austria, September 2017. Photo by Markus Igel. Before you made the food offering you would be reborn in the hells but by offering food and pleasing the guru you will be reborn in the pure land, or at least have a perfect human body, meet Dharma and actualize the path, and then achieve enlightenment. This benefit is not only relating to food, it’s anything that pleases the guru. Previously you would have been reborn in the lower realms, but if you please the guru you will be reborn in the pure realm, or become a human, become a monk. It changes from second to second, your whole karma changes your rebirth. This is something you must keep in your heart and not forget. This is the way to make your life most meaningful. 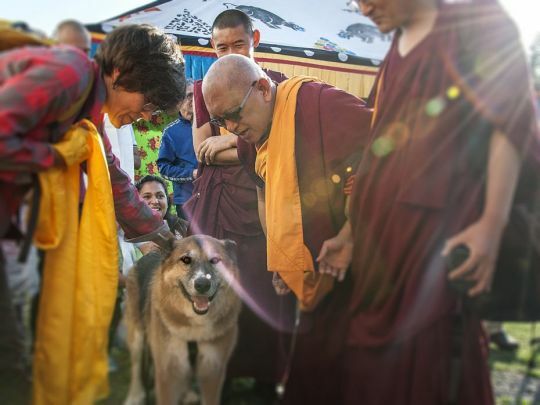 Lama Zopa Rinpoche blessing a dog at Istituto Lama Tzong Khapa, Pisa, Italy, October 2017. Photo by Piero Sirianni. You should know that karma is definite, which means it definitely brings the result. From virtue the result is definitely happiness, and from nonvirtue the result is definitely suffering. A suffering result now comes from non-virtue, if the non-virtue is not completely purified and if it hasn’t met the conditions that make it extinct. Similarly with virtue, [the result is happiness] if it’s not destroyed by heresy, anger and so forth. The second outline of karma is that it is expandable. You have to know that by making charity just one time you will experience the result for many lifetimes, for many eons. This is what you have to really know, to recognize. Happiness is not just received one time from virtue and then it is finished. This is what many people may think, but it’s not correct. We experience the result for eons. We have to experience the result, happiness, for eons. Similarly, we experience suffering as a result of non-virtue. It’s not just one time that we experience it and it’s finished; we have to experience it for eons. We have to understand that if the karma is not created then the result never happens. If the karma is created then the resultant suffering or happiness—whether great or small—never gets lost, even if it was created billions, zillions, trillions of years ago. We still have to experience the result of negative karma from billions, zillions, trillions of years ago, not just from this past life. People wonder why in the beginning they have a beautiful body and then suddenly it becomes defective, or they have a lot of mental and physical suffering. So much unimaginable suffering happens, which could be from karma created numberless eons ago. People are very surprised, and they think, “Oh, I haven’t done bad things in this life, so why am I experiencing this now?” Most people think it is just [experienced in] one life. Maybe some people think of karma created from past lives, but most don’t think it can be karma created billions or zillions of eons ago, numberless eons ago. Most people don’t think like that. At the end you can actually achieve the result—the peerless cessation and completion (enlightenment). After hearing that there is the great result, who wouldn’t want to collect merit? There is also a quote similar to this in the Arya Sanghata Sutra by the Buddha. Making offerings to monks during Losar at Kopan Monastery, Nepal, February 2017. Photo by Laura Miller. Lama Zopa Rinpoche answered a student’s question about why monks receive offerings before nuns during pujas, and advised that if the student makes offerings to the pores of the guru then the student will collect the same merit as having offered to numberless buddhas, Dharma, Sangha, statues, stupas, and scriptures. When making offerings to Sangha in pujas, generally people offer first to the monks and then to the nuns. Actually this is probably more a Tibetan custom, as in Tibet even the lay people do this. The women also do this; they always offer to the men first. From my side, how I think is that you could offer to each monk and nun at the same time. So you could have two people making offerings to monks and nuns at the same time, down the two rows. Probably you have not heard, but I am not sure. Anyway, when you are making offerings, whether to lay people or Sangha, if they have received teachings from His Holiness the Dalai Lama, and if they have the same guru as you—such as His Holiness the Dalai Lama or the center geshe—think that every one of the students is the pores of your guru. If you think that as you make offerings, then you collect unbelievable merit. You collect more merit than having made offerings to numberless buddhas, Dharma, and Sangha, and numberless statues, stupas, and scriptures in the ten directions. You collect much more merit by thinking that they are the guru’s pores and then making the offering, even to lay people. Even giving a glass of water, a piece of fruit, a biscuit, or one nut to a lay person who is a disciple of His Holiness or the center geshe, who is also your guru. By thinking that this person is the guru’s pore and then offering one biscuit or one piece of candy, you collect much more merit than having made offerings to numberless buddhas, Dharma, Sangha, and numberless statues, stupas, and scriptures in the ten directions. This is not just in a puja. This refers to any time. 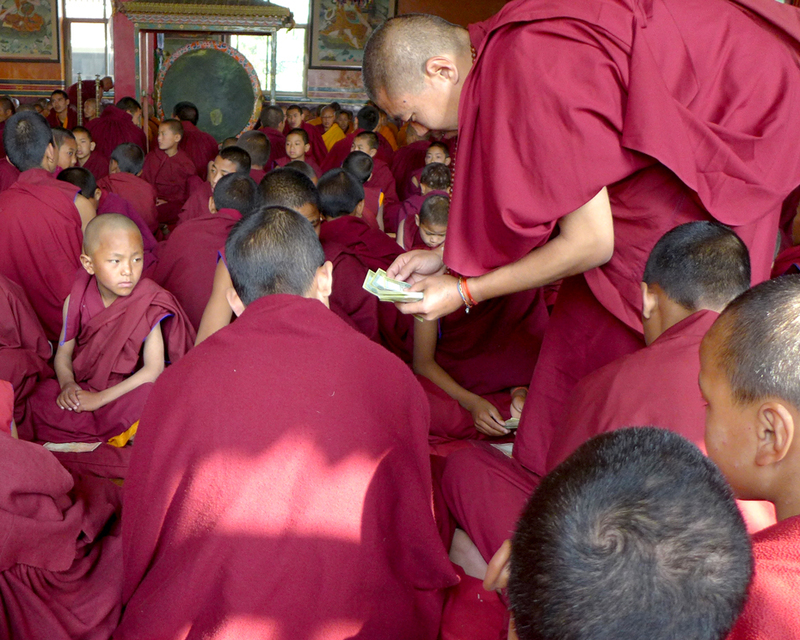 That’s why I say at the centers, don’t think that to collect merit you always have to offer to the monasteries. You can collect so much merit at the center, right there, by offering to the students who have the same guru as you. However many students there are, you can make offerings to them, and you will collect the same merit as having offered to numberless buddhas, Dharma, Sangha, statues, stupas, and scriptures. There are so many students. Group photo with Bishop Leslie Rogers Tomlinson, Lama Zopa Rinpoche, and Saint Francis of Assisi statue, Bendigo, Australia, May 2018. Photo courtesy of Owen Cole. 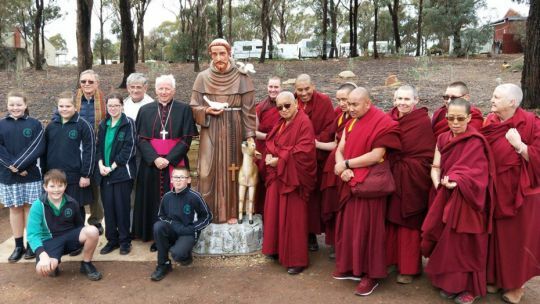 The renunciation and compassion of Saint Francis of Assisi was acknowledged in the closing stages of the retreat in Bendigo with an interfaith blessing of a life-size statue of the famous twelfth-century Catholic monk. Bishop Leslie Rogers Tomlinson and Lama Zopa Rinpoche with the statue of Saint Francis of Assisi, Bendigo, Australia, May 2018. Photo by Ven. Roger Kunsang. 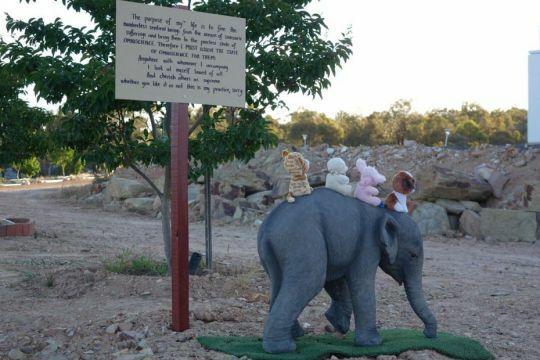 The statue is the first item to be placed in an interfaith Peace Park on the grounds of The Great Stupa of Universal Compassion. 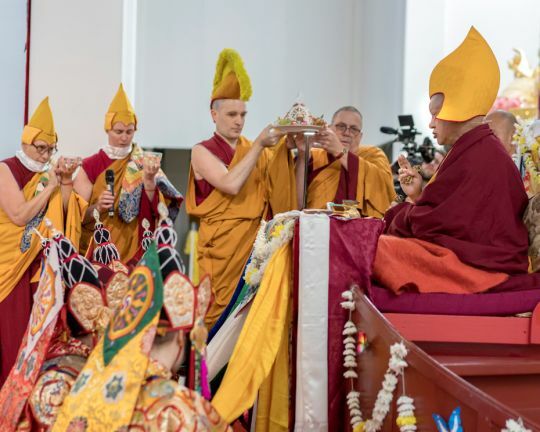 It will be joined by religious works from other faiths and was blessed by the Catholic Bishop of Sandhurst, Bishop Leslie Rogers Tomlinson, and Lama Zopa Rinpoche. Bishop Tomlinson said Saint Francis, the patron saint of the environment and animals, through his life of simplicity and poverty invites us to look at our present-day culture of excessiveness. 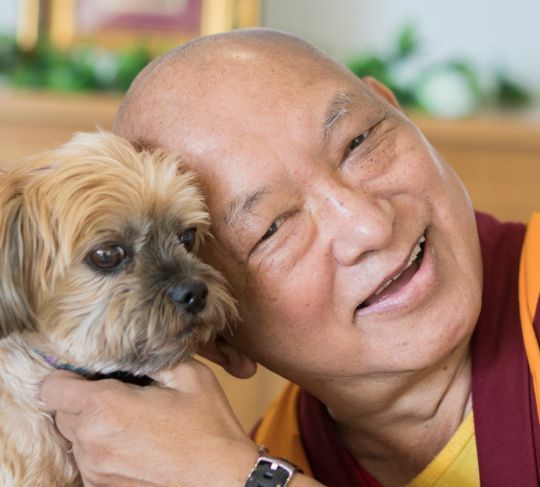 Rinpoche, who has deep respect for the saint, said Saint Francis renounced attachment to the pleasures of this life and through his miracles, showed great spiritual attainment. Rinpoche went on to explain that just like the bodhisattvas who can stop floods, Saint Francis of Assisi stopped the water from flowing in Assisi so his disciples could meditate in silence. Lama Zopa Rinpoche addressing the audience, Bendigo, Australia, May 2018. Photo by Ven. Roger Kunsang. Additions to the Peace Park will include an Ik Onkar, a 2-meter (6.5-foot) high character-symbol that represents a central tenet of Sikh philosophy, from the Sikh community; a 1.5-meter (5-foot) high mosaic from the Islamic Council of Victoria to be incorporated into an installation that recalls a story from the Quran; a statue of Ganesh from the Hindu community; a statue from The Church of Jesus Christ of Latter-day Saints; and a representation from the local Aboriginal community. Gathered for the interfaith blessing, Bendigo, Australia, May 2018. Photo courtesy of Ian Green’s Twitter page. 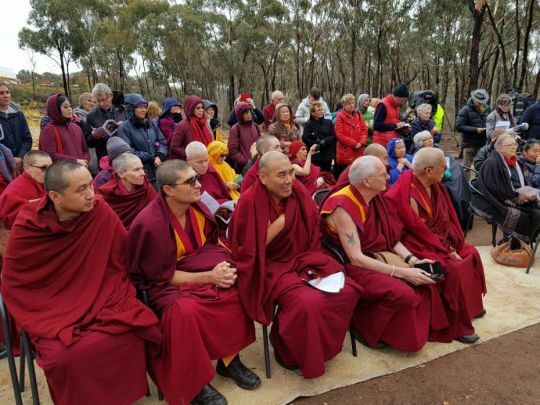 Ian Green, director of The Great Stupa, also spoke at the event, commenting that FPMT is establishing Buddhism in the West and, as Australia is a multicultural and new country, The Great Stupa should reflect that. “Rinpoche and His Holiness the Dalai Lama both thought it was a good idea to use the stupa to foster interfaith harmony,” Ian said. 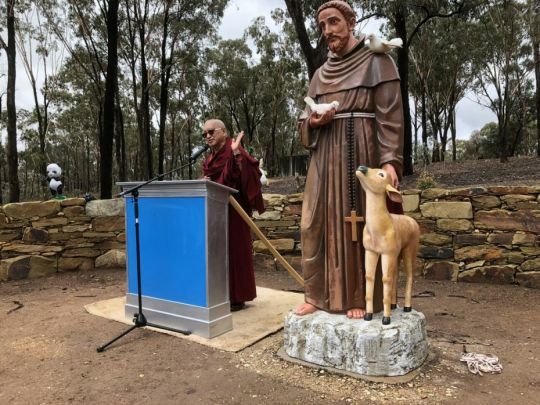 The statue of Saint Francis was sponsored by the Catholic Church and will remain their property but will be maintained by the stupa organization. 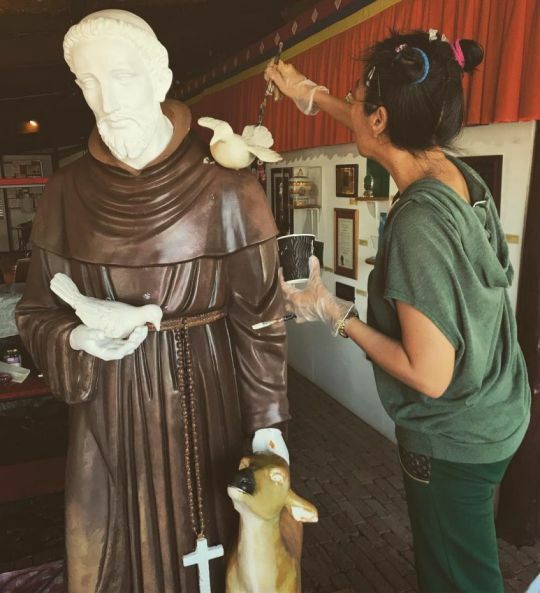 Artist Lucy Wang, who also contributed to the artwork inside The Great Stupa, painting the Saint Francis of Assisi statue, Bendigo, Australia, April 2018. Photo courtesy of The Great Stupa’s Instagram page. 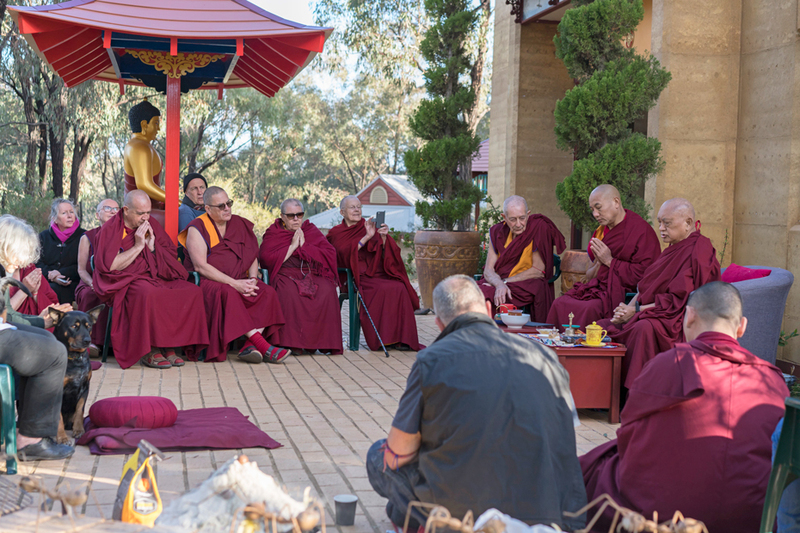 Offering tsog during long life puja for Lama Zopa Rinpoche, Great Stupa of Universal Compassion, Australia, May 2018. Photo by Ven. Lobsang Sherab. Lama Zopa Rinpoche at the Great Stupa of Universal Compassion, Bendigo, Australia, May 2018. Photo by Ven. Roger Kunsang. 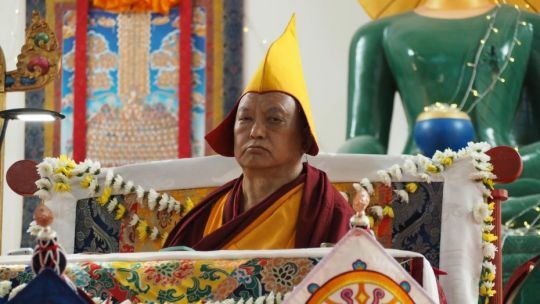 Throughout the six-week Bodhicaryavatara and Rinjung Gyatsa Retreat with Lama Zopa Rinpoche, participants commented to each other that something special was going on, that this retreat was unique, profound, and very precious. In other words, all the conditions had come together for deep and transforming practice. “By that they meant that even though many of the long-time students who attended the retreat had heard the information conveyed in the teachings before, this time the message penetrated deeper,” Owen wrote. Rinpoche himself remarked at the end of the retreat that everything went well and had been extremely harmonious and peaceful. One of the reasons for this, Rinpoche said, was that all the retreat participants did Lama Chöpa Jorcho practice for several hours every morning exactly the way that Rinpoche had instructed. Earlier in the retreat, Rinpoche had said there was no rush in doing the practice. So for six weeks, participants, led by the beautiful voice of Ven. Thubten Dechen, chanted the tunes—slowly, melodically, and mostly in Tibetan—just as Rinpoche had indicated. Doing it this way, Rinpoche said, “softened the mind” and created the beneficial conditions. A giant Tara thangka painted by Peter Iseli hung in The Great Stupa during the retreat. One day Rinpoche taught on the importance of very large thangkas, Australia, May 2018. Photo by Ven. Roger Kunsang. Lama Zopa Rinpoche and Sangha pose for a group photo after a lunch in the Stupa Cafe offered by Rinpoche to Sangha, Great Stupa of Universal Compassion, Australia, May 2018. Photo by Ven. Roger Kunsang. During the last two weeks of the retreat, Rinpoche gave a Heruka initiation over several days. Rinpoche also gave five initiations from the Rinjung Gyatsa set of 305 initiations and a Lama Tsongkhapa long life initiation for Ven. Thubten Gyatso, a senior student and director of the nearby Thubten Shedrup Ling Monastery. Rinpoche gave an unprecedented number of teachings during the retreat, all of which were streamed live online and are now available to watch as streaming video. Rinpoche’s experiential teachings covered lamrim topics, emphasizing correctly following the guru in thought and action, and bodhichitta. Rinpoche’s concluding teaching for the retreat, on May 11, was on the Twelve Links of Dependent Origination—a teaching he had received from Geshe Sopa Rinpoche—and the meaning of the popular Wheel of Life image. After the concluding teaching, a deeply felt thank you mandala was offered to Rinpoche. Ven. Gyatso and Ian Green, director of The Great Stupa of Universal Compassion, spoke on behalf of the Heart of Wisdom board, which was the body responsible for organizing the retreat. They acknowledged the contributions and hard work of their fellow board members, including Ruby Karmay, director of Atisha Centre, which is located adjacent to The Great Stupa. Ven. Tenzin Tsapel, who coordinated the spiritual program for the retreat following all of Rinpoche’s wishes, was also thanked. The retreat coordinator, Ven. Losang Dorje, was praised for the excellent work he did organizing all of the details and offered a round of applause. Ian gave a brief summary report of the retreat’s expenses. Ven. 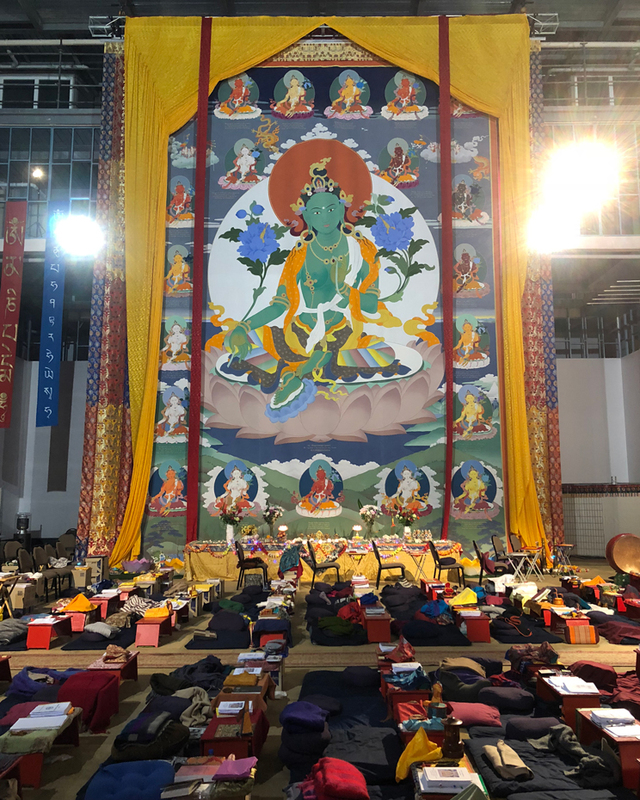 Dorje then thanked all the volunteer teams—gompa, office, and grounds and maintenance— that allowed retreat participants to focus on practice without worry of other things. The transcription work of Ven. Joan Nicell and the work of the live interpreters were also acknowledged. In addition many, many others not named here were thanked. At one point during the retreat, Rinpoche commented to Ven. Roger Kunsang that these teachings on Bodhicaryavatara and the Rinjung Gyatsa initiations are extremely important for the FPMT organization. Lama Zopa Rinpoche and Ian Green looking at a model of the master plan for The Great Stupa of Universal Compassion and grounds. Rinpoche and Ian met many times during the retreat to discuss sacred art for the stupa and future development. Photo by Ven. Roger Kunsang. During the afternoon of May 11, a large Saint Francis of Assisi statue was unveiled in the Peace Park on the grounds of The Great Stupa. 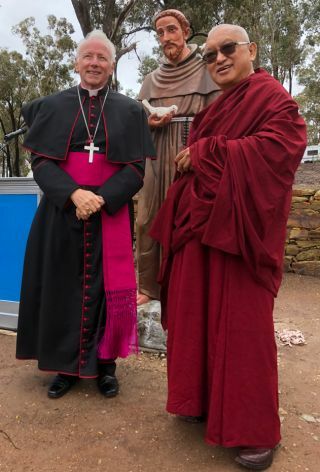 Rinpoche and the Catholic Bishop of Sandhurst, Bishop Leslie Rogers Tomlinson, blessed the statue. Meanwhile retreat participants cleaned and decorated the gompa inside The Great Stupa in preparation for the following day’s long life puja for Rinpoche. Students in the fourth week of the Bendigo Retreat who attended the 1978 November Kopan Course forty years ago. Owen Cole wrote, “In those days, many of us slept on the ground in a tent and had to take a bucket down to the local freezing Nepali spring in winter to bathe, but the Kopan courses in those days were an exhilarating experience for us all as they have been for the thousands who have attended them since.” From left, Gun Cisse (Sweden), Geoff Pullen (UK), Vicki Taylor (Sydney), Murray Wright (New Zealand), Owen Cole (Hayagriva), Kyabje Lama Zopa Rinpoche, Greg Carr (Hayagriva), Margaret Bohler (Sydney). Absent Ven. Thubten Gyatso. Photo by Ven. Roger Kunsang. “Ninety students did the whole six-week retreat with almost four hundred taking part for at least part of it. There was an average of about 160 students in any week with about one-third of those from outside Australia,” Owen Cole wrote. 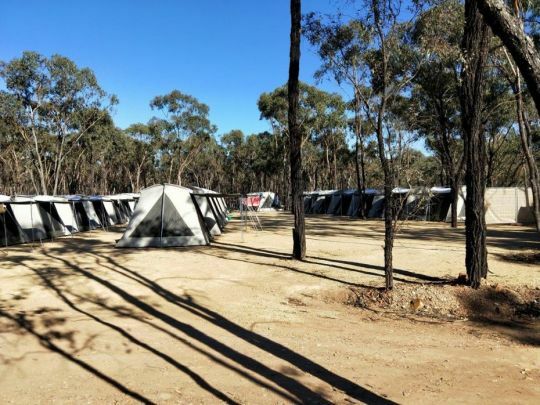 “Organizing the retreat involved creating a small village from nothing by setting up sixty accommodation tents as well as caravans, portable toilets and showers, a marquee (tent) dining hall, and a portable kitchen. Electricity for the kitchen came from a portable generator and with the number of people and lack of infrastructure, drinking water even had to be trucked into the site and sewage trucked out. The Great Stupa and marquee, Australia, May 2018. Photo by Ven. Tenzin Tsultrim. 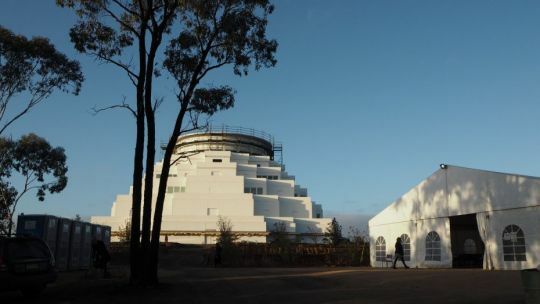 Tents set up for retreat participants at The Great Stupa of Universal Compassion, Australia, May 2018. Photo by Owen Cole. 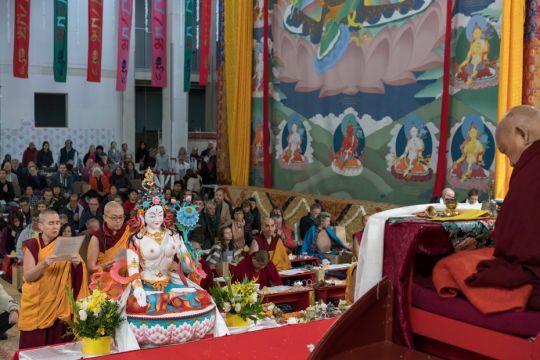 More than four hundred people attended the long life puja for Lama Zopa Rinpoche on Saturday, May 12, at The Great Stupa of Universal Compassion. Resident geshes from FPMT Australia centers were there, including Geshe Thubten Rapten (Thubten Shedrup Ling), Geshe Phuntsok Tsultrim (Chenrezig Institute), Geshe Ngawang Samten (Vajrayana Institute), Geshe Lobsang Doga (Tara Institue), and Geshe Ngawang Sonam (Hayagriva Centre). 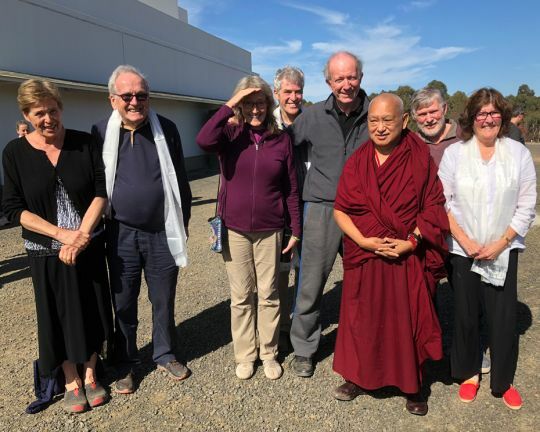 Geshe Jampa Tharchin, resident geshe at Chandrakirti Centre in New Zealand, was also there, as well as Geshe Tenzin Zopa, an FPMT touring geshe who attended the entire retreat. Lama Zopa Rinpoche during the long life puja for him, The Great Stupa of Universal Compassion, Australia, May 12, 2018. Photo by Ven. Tenzin Tsultrim. 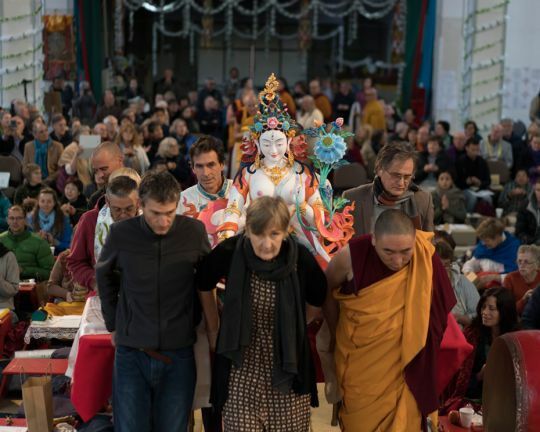 Students carrying in the White Tara statue offered to Rinpoche during the long life puja, The Great Stupa of Universal Compassion, Australia, May 2018. Photo by Ven. Lobsang Sherab. Rinpoche entered the carefully arranged gompa to gracefully falling white flower petals. 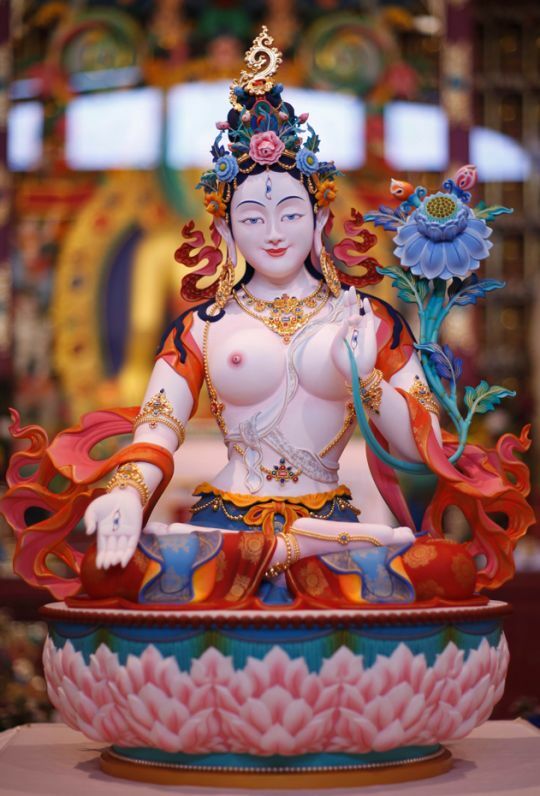 During the puja, which lasted six hours, Rinpoche was offered a White Tara statue, sculpted by Bertrand Cayla over a period of a year and painted by Sonam Sherpa and Bertrand over a period of several months at Nalanda Monastery in France. The life-sized statute was shipped to Bendigo and filled by Geshe Thubten Rapten and Ven. Gyatso. Vens. Thubten Dechen and Gyalten Wangmo offered the long life prayer to Rinpoche composed by Rangjung Neljorma Khadro Namsel Drönme (Khadro-la), masterfully sung to a Bhutanese tune. As they sang, it seemed as if sunlight illuminated the statue, creating an auspicious and touching moment. Vens. 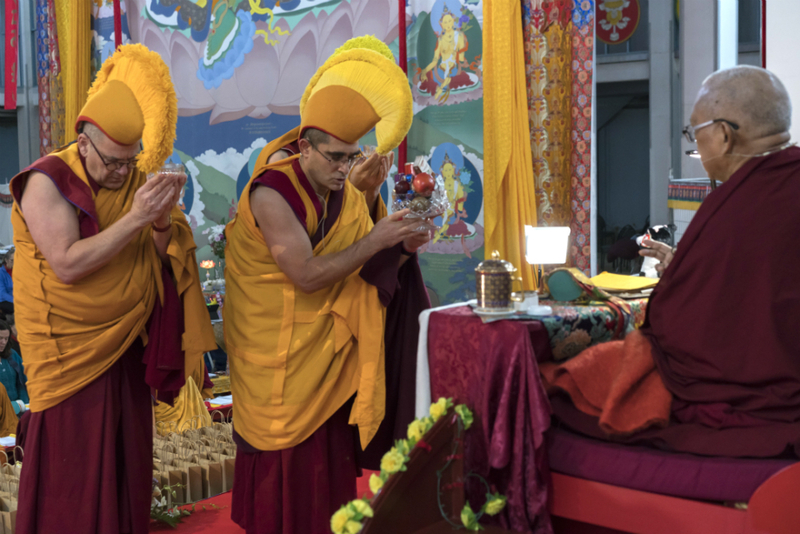 Dechen and Gyalten offer long life prayer by Khadro-la to Lama Zopa Rinpoche, The Great Stupa of Universal Compassion, Australia, May 2018. Photo by Ven. Lobsang Sherab. White Tara statue in France before being sent to Australia to be offered to Rinpoche. Photo by Bertrand Cayla. Student strongly participated in the long life puja, singing from their hearts and receiving the blessings from Rinpoche. After the puja, Rinpoche invited seventy-five people to lunch in a Nepali restaurant in Bendigo. Rinpoche offered the lunch as a way of showing appreciation to the people who have taken on important responsibilities at FPMT centers, including resident geshes and teachers, directors, spiritual program coordinators, board members, and so forth. It was a happy and relaxed time at the restaurant. The next day before leaving Thubten Shedrup Ling, where he stayed during the retreat, Rinpoche led an incense puja in the garden of the monastery. 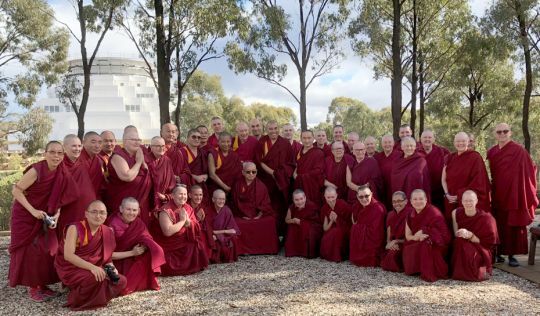 Rinpoche traveled next to Adelaide, where he blesses Buddha House’s new building on May 20. 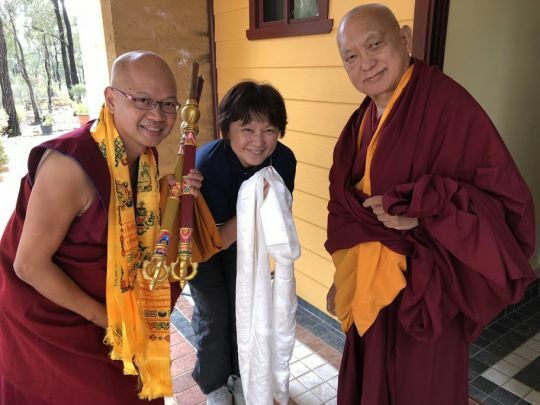 Lama Zopa Rinpoche doing incense puja at Thubten Shedrup Ling, Australia, May 2018. Photo by Ven. Lobsang Sherab.